Emu Blu Black Crystal Candle Holders. Modern, Satin Lined Gift Box. Perfect Present for Home Decoration. ELEGANT AND BEAUTIFUL: Crafted from 100% crystal glass. 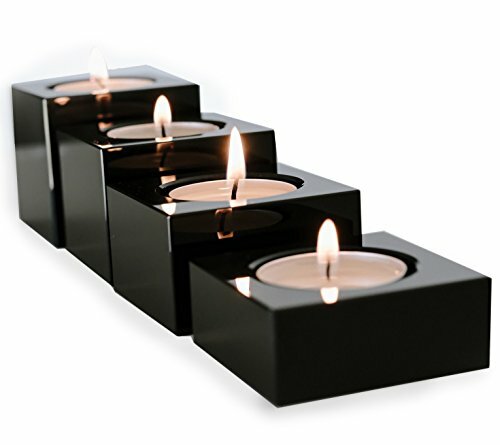 Set of 4 contrasting sized black crystal candle holders - Small: 2.4" x 2.4" x 1", Medium: 2.4" x 2.4 X 1.4", Large: 2.4" x 2.4" x 1.8", Extra Large: 2.4" x 2.4" x 2". ROMANTIC: Create tranquil, relaxed, elegant, spiritual or exotic ambiance. Emu Blu Candle Holders add an aura to any atmosphere. DECORATIVE AND MODERN GIFT: Chic Satin-lined Emu Blu Gift Box. Emu Blu tea light candle holders are textured to capture their beauty in any home decor. The perfect, appropriate gift for a wedding, birthday, house-warming, for the holiday season or simply as a thank you. FUNCTIONAL: Beautiful center-piece and modern decoration. As individual candle holders in their own space or clustered together as one unique home decor feature, Emu Blu candle holders are an envious quality in any home. GUARANTEED: If your 4 piece Candle Holder Set is not perfect upon delivery due to shipping or manufacturing faults, Emu Blu will replace your Candle Holder Set immediately. Please contact our Customer Service. Manufacturer: Yangzou Top Crystal Glass Co., Ltd. Publisher: Yangzou Top Crystal Glass Co., Ltd. Studio: Yangzou Top Crystal Glass Co., Ltd. If you have any questions about this product by Emu Blu, contact us by completing and submitting the form below. If you are looking for a specif part number, please include it with your message.